If Brett and I have learned anything it’s that it’s never too early to start thinking of the future and making plans, if necessary. Anyone who has been reading this blog or one of my earlier ones knows that we like to set goals and then get to planning so those goals can be achieved . Our current Big Adventure will continue for another 13 months – we will finish up at the end of a three-month stay in England in November 2019. But then what? We know from experience that it’s not too early to begin thinking of which direction we might like to go afterwards. So, we have started talking about what happens “after.” While the topic doesn’t dominate our conversations and we aren’t close to a decision yet, we have come up with three distinct options for the future, all of which are pretty much running equal at this point. We’re not in any hurry to make a decision because none of the options will require as much advance planning as the Big Adventure did, and we have the time now to think more about and weigh each plan as well as get input from our family before a final decision is made. The idea of living in a small urban apartment is very appealing. Settle down somewhere. That is, rent an apartment (we have absolutely no interest in buying a home), buy furniture, etc. and set up housekeeping in one place. There are lots of advantages to this option, especially when it comes to our children and their eventual plans, and we imagine this will be their first choice for us. We would like to live in an urban area, where we can continue to walk to get our groceries and use other facilities, or use public transportation when necessary. But, east coast or west coast? Our son and family will continue to live in Japan and they come to the west coast almost every year, but there’s a very strong possibility our daughters will end up living in the east. So, lots still to think about when it comes to this option. And, Brett and I wonder if we’ll really be ready to settle down, even after another year of travel. We could definitely see ourselves living in Strasbourg for a while. Live overseas for a while. We completely and totally fell in love with Strasbourg when we were there and can still envision living there, for at least a year anyway. We loved the city and its amenities, its affordability, its cuisine, how easy it was to get around to other areas in France from there and its proximity to other parts of Europe. Of course, moving overseas would require us doing a ton of paperwork in order to obtain a long-term Schengen visa, we would have to become more proficient in French, and we would have to find a place to live and then furnish it (hello IKEA!). The biggest negative is that we would be a great distance away from our children for a while which is something we would have to seriously consider. However, this might be the time to do something like this, before more grandchildren come along. The option is appealing enough that we are giving it serious consideration. Brett and I have always loved road trips and the options they provide. Continue the Big Adventure in the United States. This choice would entail buying a car (a Prius most likely) and driving around the U.S. and Canada for a year or longer, staying in Airbnb rentals just like we’re doing now. Brett and I have seen a lot of the United States over the years, and we’ve lived in a variety of places throughout the country, and both of us would enjoy having the opportunity to stay in different locations for a while and see more of an area than “just passing through.” The biggest negative with this plan for us is having to buy a car and picking up all the expenses that go along with that – it’s not an idea we’re crazy about. Brett and I are definitely, as our son has said, “restless people.” We are greatly enjoying our current nomadic lifestyle and can see ourselves continuing in some form, but the idea of settling in some place where we could continue to travel now and again also has some serious advantages. All three of the above plans come up frequently in conversation these days, with us discussing the pros and cons and how we would or could pull them off. They always seem to end up getting ranked differently each time we talk about them too which means we need to have a lot more conversation and do some more thinking about each one. Thankfully we have over a year to decide, but at some point we’re going to have to choose one and then let the real planning begin. Which one would be your choice? All three plans are very appealing. I think I’d plan to live overseas first, then travel the U.S., and then settle down. In traveling the U.S., maybe you’d find a city more central so the kids could all travel to you? And by then you may have a better idea where the girls may end up? The paperwork for the visa takes around three months to complete so we have to throw that into mix, and we have to be back in Boston in 2020 for WenYu’s graduation. Those are a couple of the things we need to take into consideration. And, I think, with a couple of exceptions, that we are either west coast or east coast people. But my rule has always been never say never, so who knows? My parents were opposites on this front. My mom was & is more of a homebody and my dad always had the wanderlust. He grew up listening to his mother tell him to “go and see things while you’re young” and never got past that. He solved his travel desires in multiple ways: convincing others to go along, which he knew she would enjoy, or (my favorite, but not hers) showing up at home with various tickets bought as “gifts” for their anniversaries. These included the Holy Land, Italy, etc. It was funny to me, and she always went along, of course. After getting over her flight anxiety, she loved the travel and still talks about the wonderful trips they took. As for me, I am living in the home I’ve lived in longest in my life including my youth. I should have been a realtor, because I still have the urge to move and start over on a regular basis. It’s a running joke here. DH will see me eyeing some property or other and get nervous. 🙂 The logistics of moving stop me now. But I did see your post as I was researching travel. I guess one either loves to go or not. Ha! Laurel – I am not sure how but this comment ended up in my spam file. Very weird. We keep changing our minds on what to do from week to week, sometimes day to day. I’m glad we have time to think this over because I know when we do it will be the right choice for the right reasons. One of the positives about each of the options is that none of them tie us down – after a year we can decide whether to continue or try something different. And, all three of them allow us to travel in one form or another. Of course that doesn’t make the decision any easier! My mom was the one with the wanderlust; my dad was the homebody. He traveled a lot with the navy courtesy of WWII and the Korean War, and then eventually ended up with a job that had him on the road every week, so he was perfectly content to be at home. He did go along with my mom though, although she didn’t do any overseas travel until long after they had divorced. Living in Europe for a year has great appeal to me! But you’d have to decide if the paperwork is worth it. I have another idea for option 3. Instead of Prius and AirBNBs, why not buy a small van-type RV and tour the U.S. In that? I’ve done it both ways- and much prefer the van because it gives the option to stay in national and state parks to hike and explore. Also, very flexible scheduling- you can go a different direction if the weather is bad, for example. Especially in the southwest, we found that the nearest town was often 50-75 miles from some beautiful parks. There are sometimes hotels in the park ( generally very high end) or just outside ( usually quickly thrown together tacky type ) but not much else. the campsites are often incredible, and with a Golden Age pass, very reasonable. If you primarily want to tour urban areas In the U.S this might not be a good option, but if you’re interested in parks and small town America, it could be great fun. The van style RVs are not awful to drive in a city….at least far enough in to get in public transit! After the paperwork we had to do each time for the girls’ adoptions, the visa paperwork is small potatoes. We’re frankly more intimidated by having to learn more French! Interesting idea about the small van RV. I will have to investigate more, but a road trip for us would involve both small town and urban America. We are thoroughly enjoying staying in Airbnbs though and had thought if we choose the road trip option we could do that most of the time, and then stay for a few days in the park lodges for national park visits. We really did feel like we “fit” in Strasbourg – there was nothing about the area we disliked. Also, we have stayed in contact with our Airbnb host there, and she said she would be able to help us with settling there. The location of Strasbourg couldn’t be better though – I think it’s one of France’s hidden gems. My father used to talk about Alsace as a wonderful area of France. (it bounced back and forth a lot). He also loved Brittany even though it was during wartime. 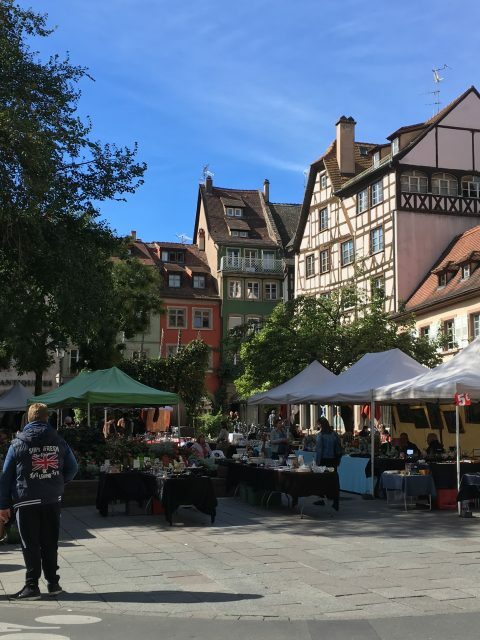 Believe it or not, one of the things we liked about Strasbourg was the German influence in the area – the city and area were very, very French but the food and architecture was different in a way that appealed to us. We found the people there very friendly and helpful too, and it was a very easy city and area to navigate. There is a big research university in the city, always a good sign, and with the European Union meeting there it’s very cosmopolitan. Brett loved all the biking that went on there, but the public transportation is superb. We also never had any trouble finding someone to speak English if we needed help, which was not true in other places. Our host’s husband is a realtor – they have said they would help us find a rental if we come back! Perhaps this might be another consideration: where the euro is trading. Right now it’s 1.1387. Who knows where it will be in the future but right now is not too bad! We have been enjoying the favorable exchange rate – it has made things far more affordable than we imagined they would be. The little green espresso maker we bought cost less here even with the exchange rate than it did on Amazon, which was surprising. It’s good you’re starting to think about this now since time has a way of flying by. I like all three options, but you first have to ask yourselves if you want to do all the work required to live in Strasbourg. A year or so isn’t very long, so is it worth it? I don’t know the answer, but just something to consider. Once you have the answer to that, then the rest will fall into place. It’s tough though to make plans based on what others are doing because who knows if your daughters will end up living near each other. I think plan A would work once you know where everyone will be, and plan C is something you could do between when you return from the Big Adventure and when you have a better idea where the kids will settle (if you don’t go to Strasbourg). Boy do we ever know about time flying! That’s why we’re talking about it now, and will talk with the girls about it when we’re together in December. Our son is the one who wants us to settle down – he knows we’re “restless,” (he is too) but he worries about us as we age. Your point about making plans to settle somewhere before knowing the girls’ final plans is a good one and something we definitely need to consider. We’re going to talk with our son and DIL when we’re in Japan next spring too, and get a better idea of what they think and why. And then we’ll decide and get going on whichever plan ends up on top! You could still live in Europe for three months (six in a year), travel in the US for the in between months – hit the East or West Coast when you want to, return to Europe the following three months. Maybe you could find another couple who would like to split an apartment overseas? The question comes- are you really interested in “furnishing” and apartment—which usually includes everything except the walls? We are doing a great deal of the US right now. I’ve been giving it all some thought. There are places I want to see in the US and places I can skip. How about flying to an inexpensive airport (Vegas vs PHX) and renting a car for a month at a time. At first it seems to be a waste of money—but the reality is that you will not have to buy, sell,store or insure anything. You, probably, would not have to have more things then you currently have, which will fit in most cars. There are a few times I would, simply, take the train to travel to see ” the middle”. They have great luggage cars for long hauls. If you start planning in the next year, you can secure reservations at some great hotels in most of the National Parks or maybe a few homes just outside of them! You know that well with your trip to the Grand Canyon. Thank you for the reminder that we just could mix things up, like doing three months in Europe then three months back in the U.S. I hadn’t thought of that option. We are sort of terrified by the thought of owning a bunch of stuff again (although I admit to having fun looking at my favorite furniture website now and again, and dreaming about what we would get). LOL – there are loads of places in the U.S. we could/would definitely skip on a road trip (Las Vegas is one of them). We sort of sketched out an itinerary but put that away so we can talk practicalities and logistics without being swayed by destinations. I am a huge fan of staying in National Park lodges if at all possible, but know you have to book w-a-y in advance. The Grand Canyon sometimes gets last minute cancellations, but you can’t count on them. We got a terrific room there at the El Tovar by booking a year in advance. How about Honolulu? I was impressed when we were over there. You’d have that urban feel, nice people, clean but have the more relaxed life of Hawaii. Flights in and out are cheaper, helping your children and you. It would make a nice home base and has a foreign feel. Just a thought. We would love to come back to Hawaii, but with the girls back east it would mean seeing less of them – we can’t afford to bring them all over (even to Honolulu), and they wouldn’t be able to afford to visit much either, even if we split the cost with them. That’s the biggest thing keeping us from returning. A couple of years ago our son and DIL seriously thought about buying a house on Oahu and then renting it to us at market price, which we all discovered we could not afford! We sure miss Kaua’i though. I will be back next year – we are definitely taking our former landlord to small claims to get our deposit back. We will ask for a judgement of the deposit and the airfare to come back and get it! To save on airline costs, how about 3 months in Strasbourg, 3 months in Ireland, 3 months in the Netherlands and 3 months (Thanksgiving and Christmas) in the US followed by 3 months in Japan. This is a very interesting solution! The biggest issue for us is Japan – we can only spend 90 days out of every 365, which means we cannot re-enter until a year after the date we leave! This sort of schedule would take care of that problem. We would also have to be careful about the time out of the Schengen area – 90 days only in every six month period, but I think your idea covers that. Thanks! I’m not a nomad, so it’s hard for me to even answer. My ideal world would be something like 4 months on the Oregon coast, 4 months in Hawaii, 4 months in California. I like to have dedicated locations & love routine, mixed in with long weekends, etc. Maybe that will change with less responsibility & schedule? Did you always have the nomad desire, it did it increase as kid responsibility decreased? I lived in the same town growing up all the way through my senior year of high school, but just always felt like I wanted to try someplace new. I often felt bored. Our time in the navy scratched took care of that – we relocated somewhere for 2 1/2 to 3 years, enough time to settle in and feel “at home,” but at the same time knowing we’d eventually be moving on. We both liked it. We were lucky though – no matter where we moved the foundation provided by the navy was always there – no hunting for a job, looking for healthcare, etc. We always knew where to go for services and so forth and could spend more time exploring the location. We settled in Portland for 25 years after Brett left the navy – we still almost can’t believe we stayed that long and put down such deep roots. But throughout those years we often thought of moving, of trying some place different, so I guess our nomadic desires were still always there, bubbling under the surface. With the kids all out of the nest now, Brett and I are enjoying the freedom of not having to maintain or deal with so much stuff, and having the freedom to move from place to place. Long answer for I guess I’ve always been a nomad at heart! And, I got lucky and married someone who felt the same way. Instead of buying a car, you could do a long term subscription from one of the car companies, where you pay a flat rate. Book by Cadillac, Access by bmw, canvas by ford, and there are others. I think they are mostly US on,y now but who knows, the concept could quickly take off globally. Great discussion and options. I would definitely be tempted to live in Strasbourg for a year, especially with a helpful host/realtor. Traveling the US is also appealing to me. I’m not sure I would be able to take on what you’re doing right now, but I do definitely get the itch to move. This is the longest I’ve ever lived in one home as an adult and I love the thought of moving but not the reality. Many interesting ideas and suggestions in these comments, and I’ll be interested in seeing what you decide. All three of the options have a lot going for them with few downsides. I think the person most against our moving to Strasbourg will be our son – he sometimes acts like we need to settle down and live right next door to a hospital, while Brett and I feel energetic and young at heart. Anyway, we will make a decision after we talk with the girls in December, and our son in the spring, and then get serious about the planning. You are so right about the actual act of moving. Ugh. It was easier this last time (in spite of our crappy landlord) because we got rid of so much stuff first. What about house sitting? Often there are house sitting gigs where you might take care of an animal (or not) for a month or two at a time. Perhaps somewhere in Europe? You might be ready to settle down by then or not…..lovely to have all the options, isn’t it? We have thought about housesitting! There are several travel websites that focus on couples doing this to save while they travel. We think though that if we live overseas it will be for a long stretch (like a year), so we would have to concentrate on a professor taking a sabbatical in that case or a business person doing a year abroad. We are staying open to all options though. Both Brett and I love train travel, and while they go a lot of places in the U.S. they don’t go everywhere. Train journeys can be very affordable but they also have the potential to become very expensive. And, unlike European trains they don’t always run on time, or even close to on time. Still, it would be nice to fit in one or two if we can. We did look into leasing, but it’s more than we expected. The subscription option that Daybyday wrote about would be a viable option though, so we are going to look more into that. We spent this morning looking at a few locations we would like to visit in the U.S. to get a feel for Airbnb prices, and there were affordable options in each place so that gives us hope as well. But, we like all our options equally and won’t be able to make a final decision until after we’ve talked with all our children. Our son is a lawyer, and I expect him to give a good argument for his top choice (but guess who taught him to argue? lol). We can stay indefinitely outside of the U.S. and can go to any U.S. embassy or consulate to renew our passports. State residency is needed for taxes, voting, etc. but I know in Hawaii we can again keep our residency indefinitely (until residency is established in another state). So no, staying outside of the U.S. for a while would not affect our status as Hawaii residents. As a U.S. citizen we cannot be “stateless” – we are always residents of one state or another. I love all three of these options! Definitely can see pros and cons for all 3. I often feel the more I travel, the more I want to see. I am lucky enough that I was able to travel a lot as a kid (my Dad worked for American Airlines) and I would go back to all of the places in a heartbeat. If you did the US option, would you want to go back to places you’ve lived, new places you haven’t seen before or a combo of both? I guess that’s the issue for us – all three options have a fairly equal amount of pros and cons. Some days we like one idea more than another, but then a couple of days later we’re talking more in depth about another way to go. I guess that’s the best thing about having all this time for now – we can never say we didn’t give X a lot of thought, or Y, if we end up choosing Z. We realized when we were in Portland this past summer that we did not want to live there again, much as we love the city and have many friends there. We’ll see again how we feel after this summer when we will be staying in a completely different part of town (west side versus east side) than we did when we lived there before. It might turn out to be a viable choice. But for now we’re thinking of places outside of Oregon we might like to live if we go with the “settle down” option. I think if it were me I would put living in a foreign country and traveling in the states on the same level and choose between those 2. If you chose the stateside apartment furnished it and in a year decided you wanted to do one of the others you would most likely take a loss when selling the furnishings. I know you don’t want to own another car but if you chose touring the states in your own car you could get a considerable portion of the cost back when you sold it and it would give you a chance to see where you might like to live next. I woke up this morning thinking, “we should just settle down somewhere” and then I read your comment and Brett and I were back talking about the pros and cons of each of our options. Thank goodness we have time to make a decision! You brought up some very good points about managing our spending (furniture? car?) and what buying those might actually entail. If I had the opportunities I would choose living abroad for awhile and then travel the US by car. We have an RV and plan to do the later in the future! All of them have so many pros, and the same amount of cons. It’s really hard to rank them which is why I think that we keep moving the order around each week. As I’ve said, I’m just grateful that we have so much time to think about them all and make the right choice.